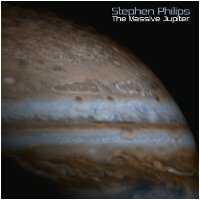 Stephen Philips returns to Earth Mantra, this time with a powerful and edgy longform power drone called The Massive Jupiter. Imagine yourself on a space ship, hurtling towards the largest planet in our solar system. Immersed in the vast silence and gravitational freedom of interplanetary space, we float, serene and perfectly still. But the globe of that giant planet grows ever larger out the front window, foreshadowing the coming storm. Then, suddenly, we transition from being just another floating body in the empty void to being a captured part of the Jovian system. The immense magnetic field, the strongest of any of the planets, slams into our ship like a tsunami, burying our electronics in a giant wall of static, with lightning flashing between metal surfaces as every part of our vessel tries vainly to find an electromagnetic equilibrium. Meanwhile, the gravitational field grows ever more powerful, tidal forces like nothing felt on Earth tearing at the hull of our ship and our very skin, monstrous stresses building and twisting, flexing us as if we were mere putty in the hands of gods. Abruptly, we pass through the worst of it and emerge into a stable orbit. Out the window we see one of the most stunning sights human eyes may ever see: the surface of Jupiter, stretching flat from horizon to horizon in all directions like the border between our universe and heaven itself, so huge the curvature of the planet cannot even be imagined, much less seen. The presence of such a gargantuan body so near to us exerts an almost psychic pressure; beneath every action and every thought the giant world lurks, eternally demanding our attention and obeisance. But so beautiful it is ... such richness of color and so much smooth motion and fluid grace ... a planet fit for the king of the gods himself, indeed. Such are the thoughts we had while listening to Stephen's new masterwork. Make no mistake; this is not your typical space music. It is unnerving, it is commanding, and it is even sometimes a bit scary. But have no fear, the turbulence eventually subsides, taking us into a lovely and resonant second half, completing the journey and making the danger all worthwhile. Another extraordinary release from Stephen Philips on Earth Mantra, and one we recommend to all our listeners without hesitation. Just remember to fasten your seat belts and get that helmet firmly in place before you launch. Awesome! Dark, surreal, cold and harsh, yet with an astonishingly delicate and smooth sound. Put your best headphones on !